It is a wise decision to export all your iPhone music to your computer regardless of whether your purpose is to simply backup the songs or make copies of them for cloud storage. A lot of people do this because the risk of losing your iPhone, accidently deleting the music, or losing all the data is pretty high. iMyFone TunesMate iPhone Transfer is one of the best tools you can use to export your iPhone/iTunes music. This third-party iPhone file management and file transfer tool offers many useful features that can make your everyday iPhone file transfer experience a breeze. Furthermore, this software is also free from bugs and errors and does not delete data when syncing which is a huge advantage over iTunes. 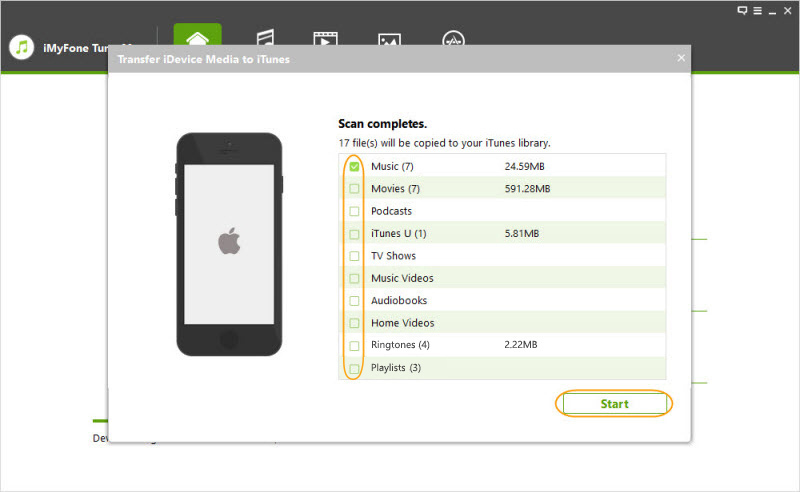 A lot of iPhone users are already using TunesMate as their primary iPhone file transfer tool. 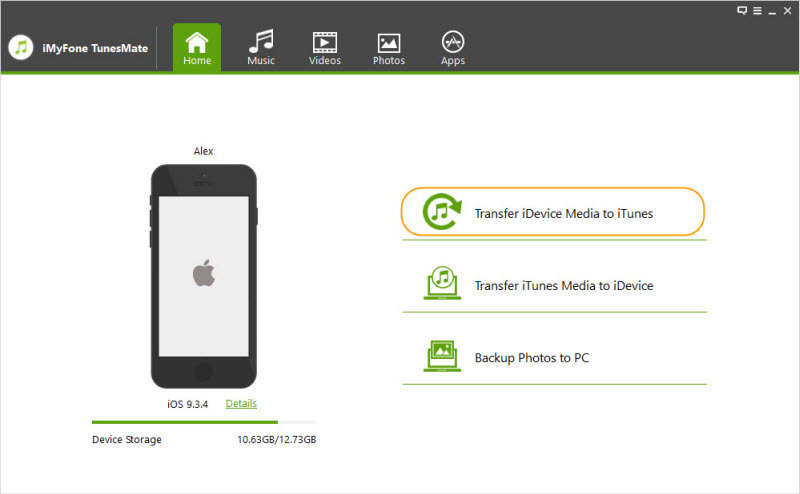 Transfer files conveniently between your iPhone and computer/iTunes and vice versa. Share purchased music with your family and friends, even if they are using different Apple IDs. All music formats are supported. Export your iPhone music to your computer all at once or individually according to your needs. Manage your playlists effectively as it offers many options including add, rename, move songs among playlists, etc. Smartly trans-codes all iDevice-incompatible formats into .mp3 and make them playable. Relatively faster transfer speed than iTunes and other iPhone media transfer tools. iMyFone TunesMate is fully compatible with iOS 11 and receive lots of positive reviews from Getintopc, Geekreply, tricksworldzz.com, etc. Use a compatible lightning cable to connect your iPhone to your PC. Launch iMyFone TunesMate. It will detect the connected iPhone automatically. Navigate to Music section via the provided tabs on the software. 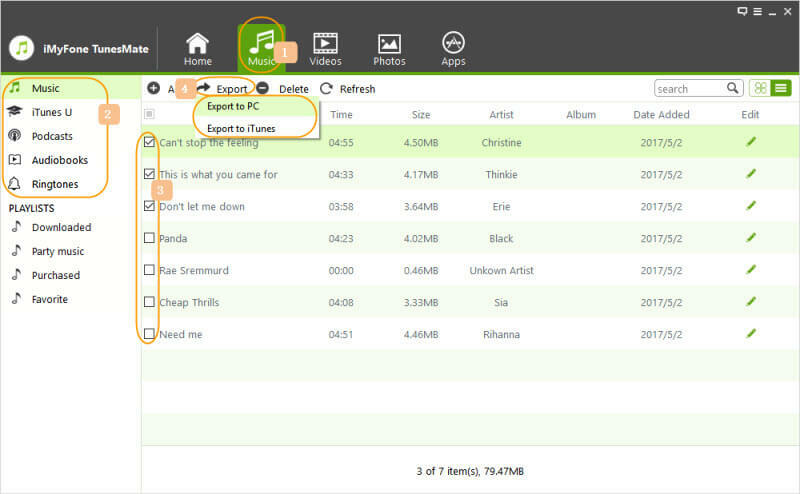 Once there, choose the music files you want to export to your computer and then click Export > Export to PC. Next, go to a folder on your computer's hard drive and then click Select Folder. Your selected songs will start exporting to your computer. Select Transfer iDevice Media to iTunes from the main page of the software. Now from the list of media types, tick Music (leave other media types unticked). Click the Start button. All your iPhone music will now start transferring to your iTunes library. 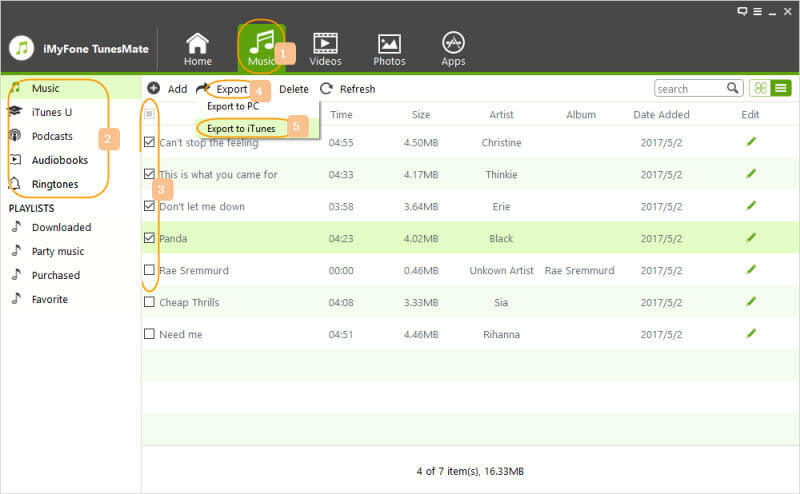 Alternatively, you can navigate to Music section of TunesMate and then select the desired files. After selection, choose Export > Export to iTunes option. Your selected songs will be transferred to your iTunes library. 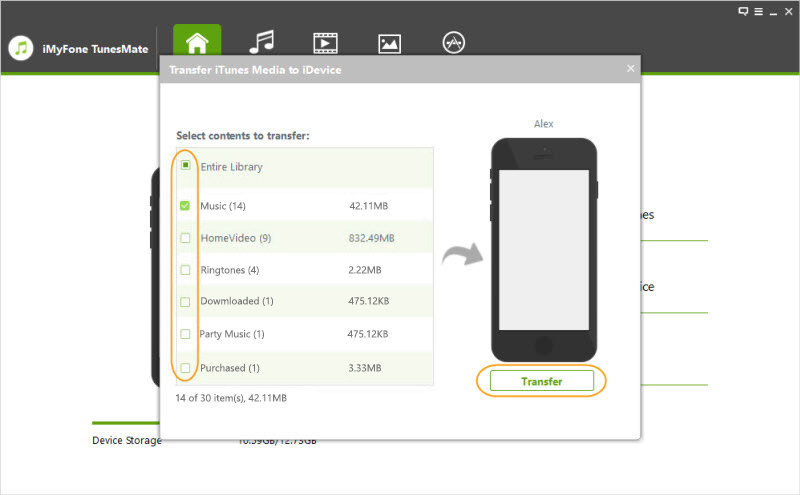 Select Transfer iTunes Media to iDevice option from the main page of TunesMate. You will be asked to select the media types to import. Choose Music from the list of options and leave others unmarked. Then click the Transfer button. All the music files will be imported from your iTunes library to your iPhone. There is no direct method of exporting music from iTunes to MP3. 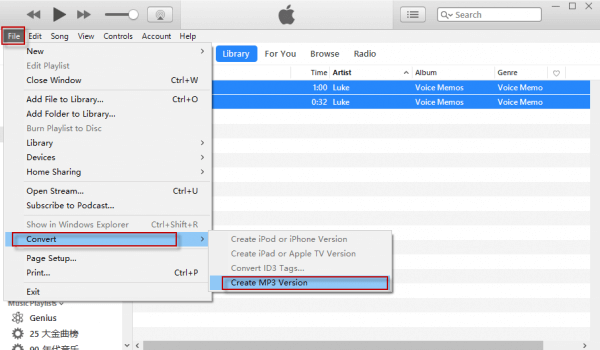 However, iTunes does allow you to convert your iPhone music to a specified format and then export the converted songs. You will need to configure your iTunes conversion preferences to achieve this. After you have configured the conversion preferences, iTunes will automatically save your converted MP3 files in a folder on your hard drive labeled as ‘My Music'. An important thing to note here is that some songs you purchase from iTunes Store will not be converted as they are copy-protected. 1. Open iTunes and navigate to Preferences section. It can be accessed from the Edit menu located at the top of the iTunes' interface. 2. Once in Preferences section, click the General tab and then choose Import Settings. You will find this option in the lower section of the window. 3. 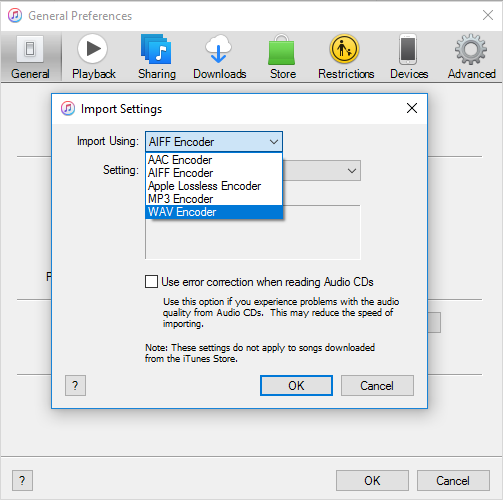 Choose MP3 Encoder option from the drop-down box of Import Using section. Save your changes by clicking OK.
4. Now find and highlight the song you wish to convert. After highlighting, click on File > Convert and choose Create MP3 Version. Conversion process will begin and MP3 version of the song will automatically appear in your iTunes library. You can then export that converted MP3 song to your computer by simply dragging it to your desktop.